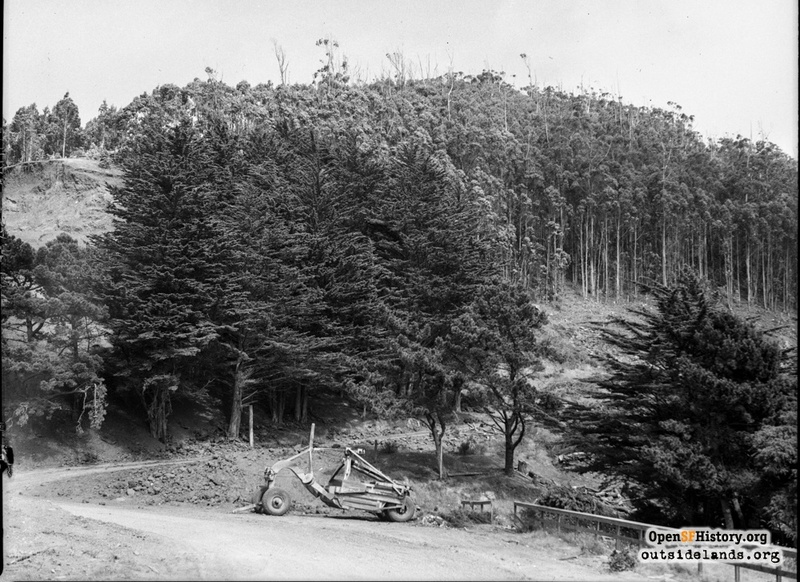 Adolph Sutro and Development "West of Twin Peaks"
In 1880, Adolph Sutro bought hundreds of acres west of Twin Peaks and planted thousands of trees during the next 20 years He created a huge forest in the middle of San Francisco. 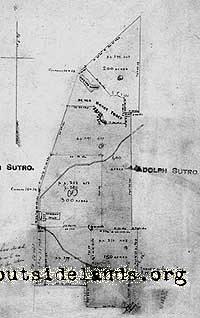 The forest might have been turned into rows of tightly packed houses on rectangular street grids, with little regard for the contours of the land--had it not been for Sutro's long stewardship and the 20-year probate after his death. A stewardship marked by farms and fires. Today some of San Francisco's most desirable neighborhoods cover Sutro's farms and forest: Forest Hill, St. Francis Wood, Ingleside Terrace, Westwood Park and adjacent areas. Desirable for their generous lot sizes, detached homes, gently curving streets, and landscaping, these neighborhoods owe their unique design to the City Beautiful movement of the early 20th century and the mania to rebuild after the 1906 earthquake and fire. Although San Francisco grew rapidly after 1849, development west of Twin Peaks lagged for decades. The land west of the hills was one vast sand dune, swept by wind and fog most of the year. A ridge of tall hills, three times taller than Telegraph Hill, cut off the western part of San Francisco from the bay side. Starting with Mount Sutro (elevation 918 feet) near Cole Valley, running south to Twin Peaks (called Los Pechos de la Choca or "the Breasts of the Indian Maiden" by the Spanish, 919 feet), and ending at Mt. Davidson (936 feet), these hills sheltered the City by the Bay from the fog and offshore wind. But they also blocked development. View of Twin Peaks looking north standing on Mt. Davidson in 1903. The road running left to right is present day Portola Drive. Tower Market stands near the white farmhouse on the left. Photo courtesy of Greg Gaar. This vast area was home to few attractions: the beach, a racecourse and scattered farming. The Beach and Ocean Race Course, built in 1865 just south of what is now Sigmund Stern Grove, featured horse racing. Large crowds made the journey through the hills on weekends. "Road houses" such as the Ocean House near the beach or Lake House near Lake Merced 1 offered food and drink. Sutro's parcel ran from the present-day University of California-San Francisco (UCSF), south along Stanyan Street, up over Twin Peaks in an imaginary line due south (aligning roughly with present-day Genesee Avenue), continuing south in the Ocean View district, then east to Junipero Serra Boulevard and to Laguna Honda reservoir (click on the map at right for a closer view in a new window). 10 It contained Mount Sutro (which Sutro named Mount Parnassus), Twin Peaks, and Mt. Davidson (called Blue Mountain). 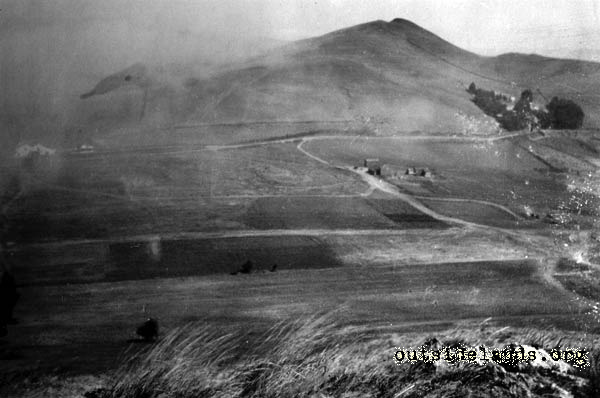 Before Sutro, these hills were called the San Miguel Hills. Notes: (Click here if you'd like the article's complete notes listed in a new window). 2. This is probably the road built by one of the early owners of the Rancho, Pioche, who built it in 1860 or shortly thereafter. This is a natural route winding its way between the hills and ravines. It had many names over the years: San Miguel Road, Mission Pass Road (Hittell 1888), Mission and Ocean Beach Macadamized Road (1872), Corbett-Portola, and Market-Portola. Market Street was finally extended southwest from 17th and Castro in the early 1920s in conjunction with building the east portal of the Twin Peaks tunnel on a curving line following the course of the earlier road. In the late 1950s Portola Drive, from Woodside to St. Francis circle, was widened and dozens of homes were moved to vacant lots. Some ended up in Daly City. 4. "Mission and Ocean Beach Macadamized Road," Surveyed by Chas. T. Healey C.E. April 4, 1872; Dames and Moore, San Francisco Department of City Planning Environmental Evaluation Application, December 14, 1987; a landslide threatened former Police Chief Fred Lau's house in 1997, San Francisco Examiner, January 27, 1997, pp. A. 5. A second trail is visible on the USGS map starting at about 19th Street and Church which snaked along the northern slopes of Liberty Hill and Dolores Heights and joined at the intersection of about 24th Street, Elizabeth Streets and Grandview and Corbett (below elevated bridge carrying present day Market Street. This was also the located of the toll house. Kortum pp. 22. 6. Kortum pp 25, various City Directories. 8. Quoted in, The Hills of San Francisco, Chronicle Books, 1959, pp 52. 9. Before the land was granted to Noe, it was part of the Mission de Dolores land holdings. According to Brother Cleary of Mission Dolores, there are no records bearing on what was grown or how the rancho was used in Mission times. It seems reasonable to infer that cattle and other animals may have been grazing on the eastern slopes of Twin Peaks. 10. Map contained in "Abstract of Title to Part of the Rancho De San Miguel Made August 9, 1880 at the Request of Messrs. Elliot J and Jos. H Moore by E.A. Rouleay," pg. 7, Bancroft Library, Sutro papers, CB 465 Box 34.